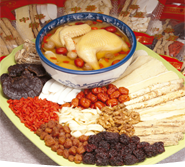 Zhongshan Zhengfeng Dried Fruit Foodstuffs Co., Ltd.
Zhengfeng was located in Torch High-Tech Industrial Development Zone of Zhongshan with scenic, prosperous economy, convenient traffic. It covers an area of 16300 square meters with large warehouses of 16000 square meters, packing workshops, large cold storage, and has stable cooperative relations with famous factories. Its staff is a well-trained team with experienced professionals who has a thorough understanding of China's domestic marker but specialized in foreign trade. With stable trade relations established with clients all over Southeast Asia, Australia, Europe and America, ZHENGFENG is an established and well-known brand. It has the reputation on the world market for variety and quality of products, and promptness and reliability in service. We looks forward to even greater and further field, developments of business ventures with both trading partners, old and new. Its trading practices continue to be built upon principles of good faith, cooperation, equality and mutual benefit. It's motto remains:"Quality Foremost, Customers' Wishes Imperative". .